Deliver moon sugar to Ri'saad. Once you have completed three reputation quests for the Thieves Guild, speak with Tonilia in the Ragged Flagon. Before you get a chance to say anything, she will ask you to do a favor for her. 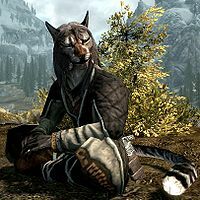 The Guild needs a reliable way to transport goods across Skyrim, and Tonilia believes the Khajiit caravans can be an asset in this regard - if they are willing, that is. She requests that you speak to the leader of the caravans, a Khajiit peddler named Ri'saad about securing an alliance between the caravans and the Guild. In addition, you are to deliver a satchel of moon sugar to Ri'saad as a gift. To find Ri'saad, use the map to fast travel close to his caravan. The caravan travels between Whiterun and Markarth, and stays outside each city for approximately two days before setting out again. Unless the caravan is camped for the night, it will move around. So, expect the target to move while you fast travel, and think about which direction it is traveling in and jump ahead. After you have located the caravan, speak to Ri'saad, and tell him that you bring an offer from the Thieves Guild. This will cause the Khajiit to become thoughtful. To continue, hand him the moon sugar, which he will gratefully accept, saying that he looks forward toward the partnership. Ri'saad will also comment that he and his fellow caravans will buy any stolen goods brought to them. To finish the quest, return to Tonilia. She will thank you for your help and reward you with a leveled amount of gold, as detailed below. In addition, the Khajiit Atahbah, Ma'jhad, and Zaynbai will now fence stolen goods for you. When not on the road, the caravan can be found either across the road from the stables outside Whiterun, or just east of Salvius Farm outside Markarth. It is not necessary to wait for the caravan to reach a city before speaking to Ri'saad. The Khajiit do not become available as fences until after you have returned to Tonilia and finished the quest. Atahbah is a member of Ri'saad's caravan, as above. Ma'jhad's caravan travels between Windhelm and Solitude, and Zaynbai's caravan takes a route between Riften and Dawnstar. Sometimes the caravan will reach its destination but the tents will not be set up. This does not hinder completion of the quest, however. On the PC, it is possible to use the console to advance through the quest by entering setstage TGFenceCaravan stage, where stage is the number of the stage you wish to complete. It is not possible to un-complete (i.e. go back) quest stages, but it is possible to clear all stages of the quest using resetquest TGFenceCaravan. This page was last modified on 20 February 2019, at 23:01.